Social Democratic Party and Accord party in Osun state have declared their support for the Senatorial candidate of the Action Democratic Party, Omooba Dotun Babayemi, for Osun West Senatorial District in the February 16, 2019 election. The Vice chairman of SDP in Osun state, Mr. Golaranmi Hamzat made this known at the final of the Second edition of Omooba Dotun Babayemi Youth Football Competition among football teams in Osun West senatorial district held at St. Anthony School, Oke-Bode, Iwo. The event also witnessed the presence of other prominent personalities including the national leader of the Action Democratic Party, Alh. Moshood Adeoti. 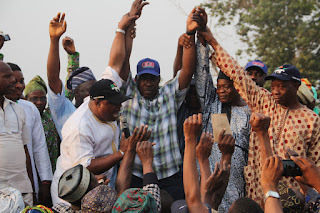 Adopting Babayemi as SDP's candidate for Osun West Senatorial poll, Hamzat said that members of the SDP in Osun West Senatorial District decided to pitch their tent with Babayemi's senatorial ambition because of their strong conviction that he is the only candidate in the senatorial district capable of representing the people effectively. While enjoining electorate in the West Senatorial District to support the Gbongan, Ayedaade Local Government born prince, Hamzat and other speakers at the programme commended the philanthropic action of Omooba Dotun Babayemi and advised others to emulate him. Also, the leadership of the Accord Party in Osun State and Osun West Senatorial District has stormed the residence of Babayemi to endorse him for the Osun West Senatorial seat in the forthcoming National Assembly Election slated for February 16, 2019. The high-level delegation was led by the State Chairman of the Party, Alhaji Abdulganiyu Opawuyi and supported by the Senatorial Leader, Alhaji Raheem Ayoola Fatai along with the Local Government Chairmen across the Senatorial District. The State Chairman, Alh. Abdulganiyu Opawuyi stated that ‎the endorsement became necessary to declare the stand of the Party early enough without ambiguity. He stated that Accord party is for the people and had carried out a detailed survey and research of the candidates for the Senate seat with the result that only Omooba Dotun Babayemi is capable to deliver the dividends of quality representation to the people of Osun West. He finally declared that Accord Party will deliver at least 22,000 votes en bloc to Omooba's election. Other party leaders also re‎iterated the endorsement and promised massive mobilization and votes for Babayemi’s election into the upper chambers of the National Assembly. 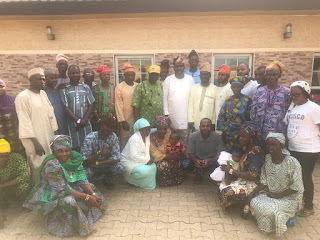 Omooba Dotun Babayemi ‎in response expressed gratitude to the Accord Party on behalf of himself, the campaign and the entire Action Democratic Party (ADP) and promised to represent the people and interest of Osun West at the National Assembly with unrivaled devotion and indefatigable commitment. The other members of the Accord Party delegation as well as the Action Democratic Party ‎elders and members in attendance were elated and rededicated themselves to the election of ODB.